Movie Review: Andrew Dosunmu’s sophomore feature film takes a sore and involving look into a Nigerian immigrant family living in Brooklyn. Ayo and Adenike, a married couple in their 30’s, are struggling to have a child. The African community sees this sensible aspect as a very important step, so the pressure is really high. Despite all the efforts, including rituals and homemade remedies, Adenike is the one to be blamed by her stern mother-in-law, for not getting pregnant, and the possibility of another woman at home becomes sadly real. After consulting a specialist, Adenike assures that the problem comes from her husband but there’s no way of convincing him to start a treatment, a posture that evinces accentuated cultural barriers and differences between free men and dutiful women in such a closed society (earn her own money and wear modern clothes are other signs that showed Adenike’s willingness for breaking the ‘rules’). When her despair comes to the limit she ponders on a last resort, one so dangerous that can destroy her life forever. 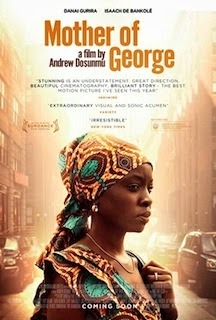 Presented with elegance and vivid colors, “Mother of George” exhibited a great sense for detail, with Dosunmu’s direction alternating between sharp close-ups and a deliberately focus/unfocused approach. Cinematographer Bradford Young did another terrific job, winning the Sundance prize, while the avant-garde African music by Philip Miller fit like a glove. Despite small inconsistencies in pace, the film grows exponentially, becoming highly recommended.